Denny Hamlin led 12 laps early in Sunday’s race on the road course in Sonoma, Calif., but contact from a competitor midway through the 110-lap event caused damage to the #11 FedEx Toyota that eventually led to a broken left-rear track bar mount, extensive time in the garage for repairs and a 37th-place finish. Hamlin looked strong early on, moving from his fourth-place starting position up to the lead by Lap 6. Staying inside the top-10 through the first round of green flag pit stops, the car seemed to be one that could contend for the victory. However, Hamlin was hit from behind in Turn 11 on the 1.99-mile road course just past the halfway point of the race, causing damage to the left-rear of his machine. At first, the damage appeared minimal, but after a few more restarts and turns on the tight, technical track, Hamlin radioed to crew chief Mike Ford that something was wrong with the rear of the #11 car. He came to pit road so the crew could assess the damage, where they discovered a broken left-rear track bar mount, and instructed him to the garage. After lengthy repairs, Hamlin returned to the track 10 laps down to the leaders and he eventually took the checkered flag in 37th to race-winner Kurt Busch. The finish dropped Hamlin two spots to 11th in the standings following Sonoma, now 110 points behind leader Carl Edwards. The Series heads back to the high banks of Daytona International Speedway for Saturday night’s Coke Zero 400. Hamlin was in position to win the season-opening Daytona 500, running third with two laps remaining before an incident on the backstretch caused right-front damage, repairs on pit road and a 21st-place result. Hamlin is making his 12th career Cup start at Daytona this weekend, with a best finish of third in the July 2009 event. In that race, the Virginia-native started sixth and led 63 laps. Hamlin has led at least one lap in his last four Cup starts at the ‘World Center of Racing,’ including seven in this year’s Daytona 500 and four in last summer’s Coke Zero 400. In total, he has led 123 laps at the track. The FedEx Express AGFS and U.S. Operations teams in Baltimore will be recognized with its “BWI” code letters on the b-post of the #11 FedEx Express Toyota this weekend. 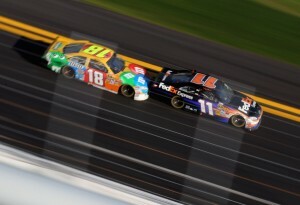 How exciting is racing at Daytona International Speedway?